I made a quick run to Boston today to meet up with my pal, Aalya, who was giving a paper at MAPACA on fan reception of horror film remakes. Aalya is another member of the Horror List and is currently writing a dissertation on horror (which I’m being allowed to read — it’s good!). Her colleague Sean also gave a paper on Let the Right One In, a fantastic Swedish film that I most highly recommend. We all went out to lunch along with Lyz and Lance, who were also giving papers, and were eventually joined by Aalya’s husband Dietrich and daughter, Sophia. Amazingly enough, the Hilton’s pub actually had good beer (i.e. everything did not end with “lite” or “weiser”) and my salmon was terrific (thanks, Aalya, for lunch! very kind). We had a good natter about horror and beer and this and that, before we all had to run off to other places. I saw a couple of folks I knew in the program, but they were all speaking much later in the day and I needed to be elsewhere. 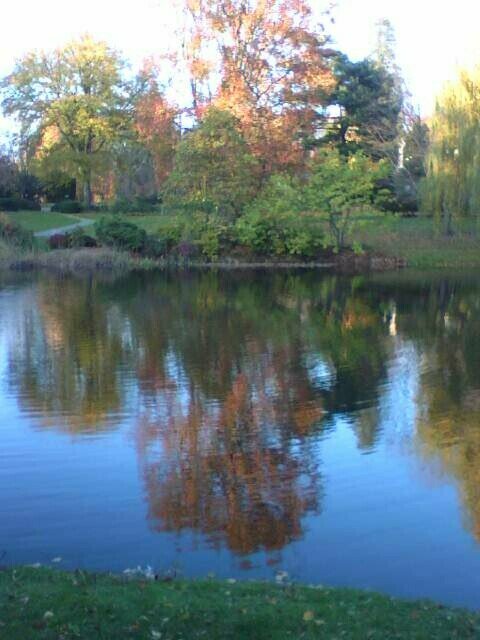 My other place to go was Mount Auburn Cemetery, where I had a little duty of remembrance to perform. Little Maggie-Moo died while we were in Texas, but I wasn’t going to leave my little Beantown cat behind there. I think she’ll enjoy being home again. Mount Auburn is a lovely location: I’ve used it as a setting for a key scene in my next novel (and have plans to include it in another work as well). White stuff: litter for angel cats. Felines from around the Challs Rivah would prefer to be Hubcats, rather than Beantown kits, I posit.I hope Buffy, whom we left with New Hampshire acquaintances in 1979 rather than make stay in a Hawaiian cage for 120 days when we moved off-continent, had a good life. That cat loved me. Back atcha. (Had a pinkish undertone to his charcoal gray fur, but that was the last cat we let my mother name.) Hawaiian bastards. Maggie was usually referred to as our Holstein cat anyway. She was always easy-going.It's hard to lose the little friends. People who don't have and love pets just don't understand. "Litter for angel cats" — LOL! 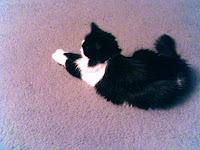 I remember Maggie…such a sweet kitty. When I cat-sat for her one time, we lay on the kitchen floor together and played.Mount Auburn is a good place for her. She was so sweet — and not just because we had Collette to compare her to! Maggie was even patient with Kipper who of course is twice her size and would jump on top of her to play because he could stand right over her. She would just give a small growl and walk away. Poor Kipper!